In my early days of working in Southampton, I worked with a fellow whose Secondary School days had been spent in Christchurch, then in Hampshire. He commented several times about the firm ‘Charlie’s Cars’, saying that one of his teachers was something of a snob who refused to use the registered name. He always called it ‘Charles’s Cars’. LJ 9501 is an Albion Valiant PV70 (Jenkinson, 1978) or SpPV70 (PSVC 2012), new in 1934, but given this Harrington C32F body in 1947. She spent several years under restoration at Cobham, but we see her taking part in the Harrington Gathering at Amberley on 3 June 2012. This second view shows the bodymaker’s plate. I have fond memories of Charlie’s Cars from my youth, growing up in Bournemouth, although I expect this fine example was already withdrawn or close to it, by the time I was born! Their garage was along the South side of Alma Road near Winton Banks. it had a large wooden sign across the entrance, at high level, with ‘Charlie’s Cars’ written on it in the house colours. The ‘sunshine’ radiator is a nice touch; was this a common feature of the period? Hebble had three Valiant coaches (two with English Electric bodies and one with Northern Counties). Whilst going through the Halifax Motor Taxation Records in about 1970 tracing local vehicles I found that one of the English Electric-bodied ones had passed just after the war to a private owner in Stainland, just outside Halifax, who was the last recorded owner, the licence having been surrended almost immediately. Later in the 1970’s when I was involved with a bus preservation group, one of the group learned purely by chance from someone he’d met of an ‘old bus’ that a man from Halifax had kept on a farm near Allerston, on the Scarborough to Pickering road, for use as a holiday caravan. On further investigation it turned out to be this very same man from Stainland and the ‘bus’ was that Hebble Valiant – JX 507. How exciting – what a rare survivor, and when could we go and have a look with a view to acquiring it. Then it turned out that it had been dragged out of its spot only a couple of weeks beforehand and totally destroyed. It had survived all that time, and we’d missed it by two weeks. Isn’t that always the way ? Thanks, Grahame and Ronnie. Whilst the feature is an element of the Albion badge, as Ronnie says, I’ve never seen it on another Albion radiator. 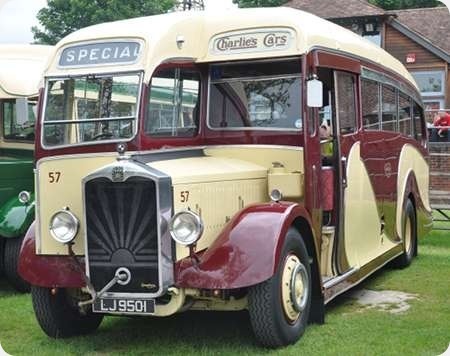 Perhaps that’s because this is a preserved vehicle, and kept cleaner than many would be whilst ‘working’. Any offers on that? This Albion features in my Gallery compilation HCVS Charabanc trip 2011. Seen when visiting the owners private collection. It was also an entry on 2010 Trans Pennine Run.